Barn door hardware—whether being used in residential or commercial applications—can define a space. Here at Häfele, we know this. And that is why our assortment includes fittings which don’t just follow the herd. They lead them. Barn door hardware fittings from Häfele have an architectural appeal that encourages a wide variety of applications. Make a grand statement in the kitchen. Add texture and visual interest to a studio or den. Divide a large room into two. Add sliding cover to a pantry area or bookshelf. Or take a walk-in closet to the next level. For homeowners seeking a unique design solution, barn door hardware lets you be dramatic and distinctive. Wood barn doors or glass? Häfele offers a selection of modern, stainless steel hardware for each. Fittings can be mounted directly to the wall, making installation quick and easy. Designs range from subtle to distinctive, providing a beautiful accent for both modern and rustic interior themes. We were very selective when building our sliding barn door hardware brand offering. We offer barn door hardware such as incomparable Flatec line for wood doors with its beautifully-executed stainless steel rods and maintenance-free design. We have the stylish and unique Tritec, a new standard in glass sliding door solutions. Whatever the need for barn door hardware—by design or application—our customers have grown to expect and receive nothing but the best from us. 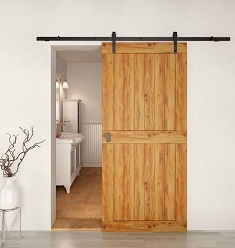 Looking for trendy barn door hardware? We carry Flatec, Antra, Unotec, Tritec and more—the most highly sought after brands and designs on the market today. From contemporary to rustic, we’ve got the solution you need to close a door, cover a pantry or simply add personality to your design vision.